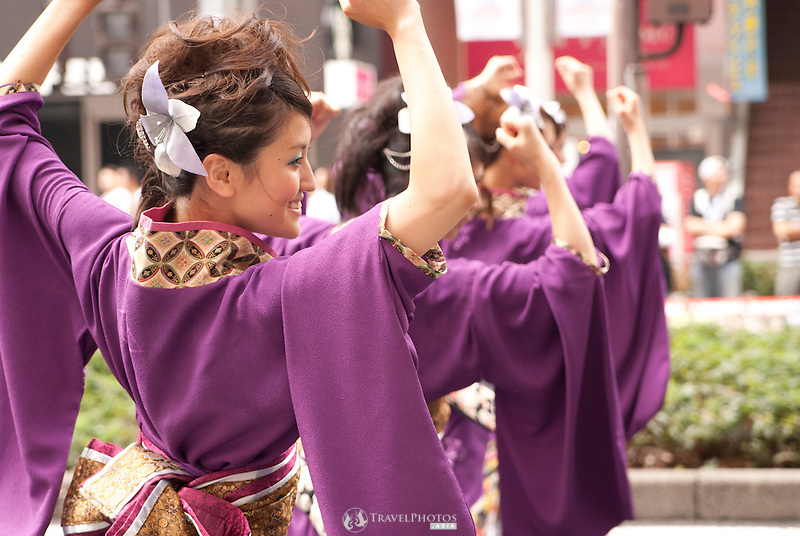 New domatsuri (Nagoya Dance Festival) photos have been added to the Culture Gallery of my portfolio. There’s plenty to choose from. These are especially good for news and media distribution. The origin of the festival is a little sad. It was started by some local university clubs, but was taken over by the city; taking control away from university students and to benefit the local government. However, not all is bad. Today, there are a variety of teams that compete. There are still university teams, also community groups, local towns (which include children, parents, and grandparents), overseas dance guests, and even the local professional pop group SKE48. Each team can have between about 10 to 50 members, and there can be over 200 teams participating, and so as of 2014, there were about 23,000 entrants. The best teams are typically the university clubs who aim to win; and the teams that are usually the most impressive are typically the Kyoto and Hokkaido teams. The music is played from an accompanying truck that rolls ahead of the group as they advance along the street. The crowds are dazzled by amazing costumes and amazing dance moves. Of course, the teams of older ladies and community groups are there for the experience, but there are groups that are amazing to watch. The event generates a huge number of photos, and so eventually I will cut back on the number I keep in my portfolio. So, please get the ones you want as soon as possible. It was on this weekend, but I didn’t go (I was preparing for the Vietnam trip I’m currently on). The Domatsuri (dance festival) is a great spectacular to watch, where typically 200 teams of between 30 to 50 members (it’s a big event) do a highly synchronised dance. The dance is performed on a stage, and a second routine is performed progressing along part of a road in the trendy Sakae shopping district. Many of the dance teams are community groups who enter every year, and typically these teams don’t vary their routines or costumes, which is why I’m a bit lukewarm about the event this year. But there are some teams that are in it to win, and they are truly worth watching. The link to this Domatsuri photo: 20110828_DSC5362.jpg. Past Domatsuri posts, and videos on the YouTube page. The annual Nagoya Domatsuri (dance festival) is on this weekend, and so it’s the Photo of the Week. It usually attracts about and over 20,000 people in over 200 dance teams, and of course, many, many more spectators. Teams compete for prizes, but usually it’s just a hobby that brings community groups together. For some info and history see previous Domatsuri blog posts, and for more Domatsuri photos see my agent’s website: Henry Westheim / Asia Photo Connection, and my Domatsuri gallery on my portfolio. This Photo of the Week (POTW) is from the Nagoya Dance Festival (Domatsuri), which attracts over 250 teams teams mainly from the Nagoya area, as well as places far afield as Hokkaido and Kyushu, and, apparently, occasionally some international teams. See the domatsuri tag for more info, my Asia Photo Connection / Henry Westheim agent, and my PhotoShelter portfolios for more photos, and here for the most recent domatsuri video. There’s a lot coming up in the coming hot & humid months. Nagoya Sumo Tournament, 10th to 24th July. Local town summer festivals begin (‘matsuri’). Yoyama Festival in Kyoto, 15th & 16th July. Kuwana City Stone-bringing Festival (Kuwana Ishidoria, the loudest festival in Japan), 3rd & 4th Aug.
Word Cosplay competition, 3rd & 4th Aug.
Nagoya Dance Festival (Nagoya Domatsuri), 26th to 28th Aug.
I’m quite busy and so I need to prioritise my schedule. Consequently, there’s no guarantee that I can go to these unless my services are pre-arranged. It’s taken a while, but they’re finally done being processed. Domatsuri images are available at both my Asia Photo Connection portfolio and my PhotoShelter account. In case you’re wondering. The Nagoya Dance Festival (or ‘domatsuri’) is an annual event held in summer. It’s based on the Hokkaido version of the traditional Japanese dance and town festival. Hokkaido was first occupied by the Japanese a little over one hundred years ago, mostly by Japanese who were running from the law, had debts that couldn’t be repaid and so forth. The Sapporo (main city in Hokkaido) dance festival is an ecclectic mix of different dance styles, and because of its proximity it also has Chinese and kung-fu influences, too. Some university from Nagoya entered the Sapporo dance festival and imported it to Nagoya the following year. Soon after the City of Nagoya took it over and the Nagoya Dance Festival became bigger and well established. Today, it retains it’s Sino-kung fu-Hokkaido-traditional Japanese dance styles, and attracts dance teams from all over Japan, including university teams, local townships, community groups, company sponsored teams, and this year the highly popular and local teen-music group SKE-48 (I briefly saw them at the end and couldn’t get any shots… dammit!). Over 200 teams a year enter, with an enrolment of over 23,000 participants. It attracts a TV viewing audience of nearly two million viewers. My images are at my Asia Photo Connection and my PhotoShelter portfolios; ready for immediate purchase.